"We're not alone. There's something here." 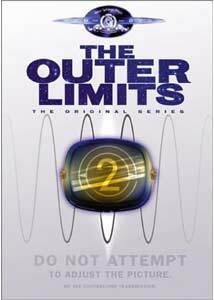 Although thoughtful science fiction wasn't believed to play well on television until recent years (Star Trek excepted), The Outer Limits in its first season demonstrated that such intelligent but speculative programming could draw an audience, if not be highly successful. Renewed for a second season, the program unfortunately ran only another 17 episodes before drawing to a close. That second season, with its bleaker and more grim and paranoiac air, was perhaps just too uncomfortable for a nation still reeling from the shock of JFK's assassination. These programs are nonetheless some of the better programming of the early 1960s, despite low production budgets. Top-notch writers, directors and stars make for an unforgettable viewing experience. Indeed, I remember little from television from 40 years ago, but this season has stuck with me for a good long time. The series starts with a bang with what's described here as the first produced teleplay by the great Harlan Ellison. The turn of the series is immediately evident as a soldier, Qarlo (Michael Ansara) from a nightmarish future world where everything centers on war is captured and examined. A philologist, Tim Kagan (Lloyd Nolan) attempts to communicate with Qarlo and get him to adapt. Ansara is suitably intense, and Kagan makes for a good obsessive. And how often do you see a philologist as a hero (or in any role, for that matter) on television? Four solid televisions. William Shatner stars as astronaut Jeff Barton, returned from Venus and ready to make a presentation to a Congressional committee on appropriations for a trip to colonize Mars (amusingly named Project Vulcan). But something's wrong with Barton, for he can't seem to stay warm. Here the alien presences are distinctly not benevolent, but terrifying. The episode suffers from some clumsy and repetitive imposition and substandard (even for this series) special effects. When Shatner's spaceship slows down, we even hear brakes squealing! Combined with a lame conclusion, this merits only two teevees. John Carpenter's cult favorite They Live gets an early workout here, combined with Edwin Abbott's classic of mathematics, Flatland. Not satisfied with philologist heroes, this time the series turns to opticians as Dr. James Stone (Peter Lind Hayes) develops a new kind of glasses made from meteoric quartz. When he realizes that the polarized light of the glasses allows him to see a two-dimensional creature, Eck, he attempts to contact the people to whom he gave the glasses, but they're all turning up dead. The effects again let this episode down, as Eck is crudely animated, but the story is clever and while Eck does indeed pose a threat, it's not the one initially believed. High concept and entertaining and good for four sets. Aldous Huxley had already written about drugs opening the "doors of perception," and academic experimentation with consciousness-expanding drugs was already being discussed in the pages of Life magazine by 1964. Combining the concept with Stevenson's The Strange Case of Dr. Jekyll and Mr. Hyde was probably a natural. But here Hyde sees himself as the Nietzschean Übermensch, beyond laws and rules. Featuring a startling moment on the autopsy table as well, this episode also includes an early appearance by the barely recognizable James Doohan as the police investigator on the track of a mysterious killer. Although essentially conservative in tone, it does demonstrate some imagination and some nasty makeup effects and thus merits three and a half televisions. Harlan Ellison returns to the series with a vengeance, as this episode contains enough imagination for ten episodes of any other series. Trent (Robert Culp), a man from a thousand years in the future, has been sent back in time to safeguard the fate of the human race. A computer mounted in his glass left hand is supposed to tell him how to do that, but three of the fingers are missing and in its mutilated state is unable to be of much help to him. Unfortunately, the other fingers are all in the hands of an invading alien race that has come back in time for Trent and means to kill him and seize the glass hand for themselves. The air of paranoia and confusion is truly mind-shaking, and Culp delivers a fine performance as the man on a mission that he doesn't understand. Veteran director Byron Haskin makes the most of his setting, an old building in the garment district, using its florid ironwork to create a veritable jungle around Trent and increase the terror. Despite a few production mishaps (a supposedly dead body takes several plainly-visible breaths onscreen), five well-earned televisions for one of the finest moments in TV history. Alas, we go from the sublime to the mostly ridiculous with the next episode. Eddie Albert stars as Andy Thorne, an engineer wanting to leave the ratrace of the city and find a farm in the middle of nowhere (say, that sounds like an idea for a series....). When he and wife Karen (June Havoc) find themselves trapped in the wilderness, they're assaulted by tumbleweeds. Yes, it's When Tumbleweeds Attack. The couple eventually find sanctuary with Lamont, a local farmer, but things don't seem to be quite right with old Lamont. As unrepentantly silly as this often sounds (and looks), there are some creepily effective moments, especially scenes in Lamont's cabin as the tumbleweeds scratch outside, anticipating Night of the Living Dead and capitalizing on the claustrophobia that it engenders. Still merits two and a half teevees. A landing on Mars goes badly when the two members of the crew vanish, screaming. A followup mission led by Medal of Honor winner Major Chuck Merritt (Batman himself, Adam West). Failures of discipline lead to more casualties and a deepening mystery about what lies under the sands of Mars. West makes for a fine starship captain, and had he not picked up the cowl would have made an admirable captain of the Enterprise too. The crew is equipped with fun weaponry too, like nuclear-tipped bazookas. The science is sadly laughable, even by 1960s standards, for a breathable atmosphere is conjectured for Mars, and the crew go out without helmets or protective gear of any kind. Poorly-made fiberglass monsters don't help. A weak two teevees. Scientist Jonathan Meridith (Patrick O'Neal) mimics the conditions of planet Wolf 359 in the laboratory. By accelerating evolution (by means unspecified), he develops life on the simulation ("Dundee Planet"). But the life has an intelligence and malevolence that he had not counted on. The episode continues the theme of hostile and dangerous alien races, while providing a frightening look at man's future evolution as well as the effects of the experimentation on Meridith's personal relationships both in the lab and at home. O'Neal is suitably intense and gives the episode a serious drive. Four televisions under the control of the Control Voice. Doctor Charles Link (Peter Brocco) has developed a robot, Adam, and given it intelligence. When Adam is found standing over the doctor's injured corpse, the local law enforcement officers intend to dismantle him. But Dr. Link's daughter refuses to believe that Adam could have harmed him, and appeals to retired litigator Thurman Cutler (Broadway star Howard da Silva) to save Adam. Leonard Nimoy also has a sizeable part as a caustic reporter assigned to the case. Based on the classic "Eando Binder" Adam Link stories, the episode takes a look at what it means to be human and what separates humanity from machines, with the machines coming out substantially better. This episode would have fit right into the first season with its many misunderstood alien races. Well done little courtroom drama that merits four televisions. Robert Duvall stars as government agent Adam Ballard in this two-part episode (unhappily split by a disc flip). A series of four American soldiers fighting in the jungle (an unnamed Vietnam, presumably) are shot in the head. All four of them develop a second, different brainwave which is identical among the four, and all suddenly get an IQ above 200. Things get out of hand when the men vanish and begin working for some mysterious goal, and they fully develop their mind-boggling powers as physicist, biochemist, metallurgist and financial wizard in addition to other more supernatural powers. The war setting and an intense paranoiac feel are propelled by the casting, with Duvall highly credible as a driven bureaucrat, and the four men display both a smug obsession with their strange project and a terrified remorse at what their bodies are doing, without their consent. A full five sets for this epic-length program. When scientist Eric Plummer (Warren Stevens) is unable to come up with some key equations for his disintegration ray project, he strikes a Faustian bargain with Ikar, an alien who wants to learn more about Earth: in exchange for the equations, Eric will transfer his emotions to Ikar. But the learning process may be too much for Ikar, once he learns to experience both hate and love, taking him outside the hive mind. This episode has a tendency to devolve into sappy and pat discussion of humanity without providing any serious substance or challenging thought behind it. The heroine, Eric's girlfriend Janet (Gail Kobe) is appropriately horrified at the fate reserved for women in the corporatist society of Ikar. Although the alien makeup is rather contrived, the balloonlike head and face composed of gills is still striking enough that I vividly recalled it from nearly forty years ago. Two TVs for the content, with a bonus half for the alien makeup. Future behavioral scientist Henderson James (Randell) has a problem: he has illegally imported a ferocious killing creature known as a Megasoid for study. But the creature has escaped and is about to reproduce. What can Henderson do? Well, he can have a duplicate made of himself and send it off to kill the thing. But the duplicate starts to learn too much about the original's life and doesn't necessarily want to be destroyed once its task is complete.... The Megasoid is the weak part of the program, looking like a gorilla suit with a chicken head, and laugh-inspiring rather than shiver-inducing. More interesting is the existential dilemma between the duplicate and the original Henderson James, made even more complex by the fact his wife Laura (Constance Towers) is interested in taking a second chance at life with the tabula rasa of the duplicate. Four teevees, with a deduction of one-half for the lame monster suit. This episode uses its sci-fi trappings to produce a character study. Six people, most of them scientists, are tested to act as passengers on an interplanetary mission. The form of the test is a complete simulation of the flight, but the hitch is that no one can cancel the test without all of them being rejected. When a strange light begins to affect the minds of the passengers, cancellation looks as if it might be the wisest choice. But engineer Joe Dix sees that he stands to make millions from this trip, and will not permit cancellation, even if someone has to get killed in the process. There are some rather unwieldy bits of exposition, and there are a whole lot of unanswered questions about the setup, but the interaction of the characters is written and portrayed well enough that it all goes down easily enough. Three televisions. Colonel Barham (Anthony Eisley) is terminally ill, but the project that he works with has a plan: they'll hook his brain up to a supercomputer, keeping it alive indefinitely and injecting creativity into the computing process. Things don't go as well as planned, though, as Barham's wife Jennifer (Elizabeth Perry) rejects what has become of her husband, while the brain develops mental control over others, not to mention a sense of omnipotence and a strong streak of paranoia. The combination is predictably deadly. It's a good setup, but it feels a bit rushed towards the end. This probably could have been a two-parter like The Inheritors because there's still a lot of territory unmined in the final program. A notable appearance here is the hero, Major Douglas McKinnon, portrayed by Grant Williams, the Incredible Shrinking Man himself. Four sets. There are often unintended consequences to science; when the first atomic bomb test was conducted, there was always a possibility that all reality would go up in a blazing fireball. Such unintended consequences hit test pilot Jim Darcy (Dewey Martin) as he hits Mach 6 at the same instant as his wife Linda (Mary Murphy) gets in a car wreck. In a nightmarish consequence, they are the only people moving in a world utterly frozen; even birds in flight are stock still. They appear to have come unstuck in time, but an apparition warns them that they are in serious danger. But can they save themselves and rescue their daughter, who is about to be run over by a truck? The print is rather poor here, with the sound warbling a couple of times. The stock footage is in bad shape but it probably always looked that way. This is one of the more aggressively nightmarish episodes in the season, and chilling even though the underlying reason for the occurrence doesn't hang together all that well. Four teevees to this one. The series comes to a surreal conclusion with this oddball entry. A cargo plane goes down in a hurricane, but the occupants of the lifeboat awaken to find themselves in a strange chamber. A series of inexplicable events occur, involving alien experiments, human-filled test tubes and giant mutant microbes among other things, making for a paranoid and totally whacked little tale of self-realization. There's a lot of odd talk about analog computers that probably sounded good in 1965, but just come off as strange today. The hopeful aspect of the first series returns for a last hurrah as the prisoners strive to communicate with their captors. A strong finish, good for four televisions. Image Transfer Review: The original full-frame presentations look very good, especially when compared to other television of the time, such as the 1964 Avengers. Shot on film rather than video or kinescope, the prints are generally in very fine condition with only occasional speckling, hairs and the like. The main problems are poorly compressed grain structure, which causes backgrounds to look sparkly, and a frequent tendency for aliasing. The black and white picture is excellent, with deep blacks, tons of shadow detail and a very wide greyscale. Had the set been issued on DVD-18s with 3 episodes per side, instead of DVD-14 with 4 and 2 episodes, respectively, there might have been more bit room for the compression of the grain. But that's a pretty small fault; these never looked this good on your 1964 Zenith. Audio Transfer Review: The 2.0 mono audio generally sounds acceptable, if unimpressive. However, in louder sequences music and effects tend to distort badly. This is probably a limitation of the source material. Hiss and noise are fairly mild, considering the age of these programs. Dialogue is almost always clear. Extras Review: The set contains three DVD-14s (dual layer on one side, single layer on the other), and a booklet that contains synopses and credits for each episode (in tiny, hardly legible print). Beyond that, there's nothing, not even subtitles. Chaptering appears to fall at each commercial break; though not generous it's a sensible approach. The classic series is now complete on DVD, and sci-fi and horror fans will definitely want to own it. The transfer is good but not spectacular, and extras are unfortunately pretty much AWOL.